It can sometimes be difficult to get a great night’s sleep, especially since we all lead such busy fast paced lives. A great night’s sleep is a key part of a healthy lifestyle, and can benefit your heart, weight, mind, and so much more. 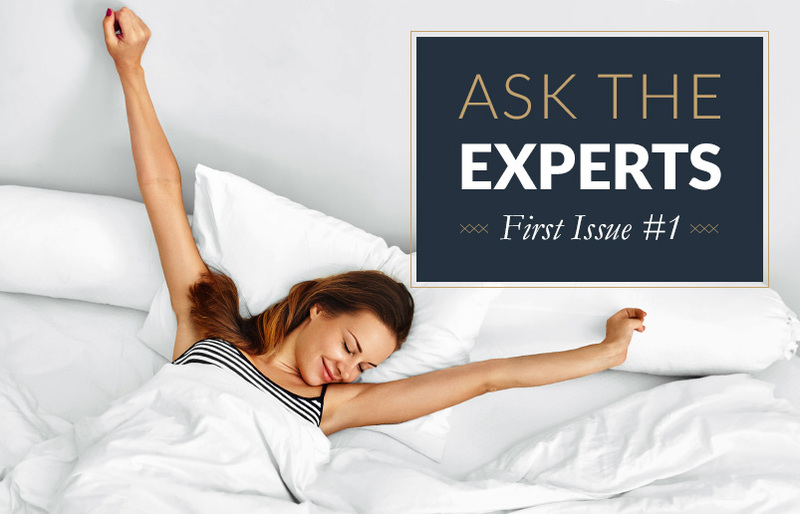 Here are our 6 top tips for getting a great night’s sleep. It is no secret that a comfy bed and amazing bed linen helps you fall asleep. You spend up to a third of your life sleeping, over a lifespan, that’s more than 26 years! Investing in your bed and bed linen is a no brainer. But what makes the perfect bed? It is very important to choose the right mattress! Some people sleep better on firmer mattresses, while others prefer softer ones. Take your time, ask expert dealers questions and advice, and try it out for at least 20min before you buy it. In short, choose the mattress that works best for you. Also, by using a mattress protector, you help prevent agitating allergies while you sleep and keeps the mattress feeling in “like new” condition for longer. Extra benefits are that the protector keeps the mattress clean and helps guard your mattress warranty. Do you wake up with a sore neck and shoulders? The secret to the right pillow is to make sure it keeps your head in alignment with the rest of your body. Feather and down pillows are some of the most comfortable but often they lose their shape and volume the older they get which causes a misalignment with your body and head. Feather and down pillow can also irritate allergies in some people, so a great substitute is a high quality microfibre pillow. It has the same down like fluffy feel and is also an anti-allergy pillow that keeps its shape longer. Why is bed linen so important for a good night’s sleep? Well, if you are like me, then you love getting into fresh clean crisp sheets, it just gets me ready for a great night’s sleep. It is also important to get the right bedding because it helps keep you at a good temperature for sleep, so breathable materials like cotton can be a good choice. Another great tip is to always ask for Percale fabric; it is closely woven fabric with a minimum of 180 thread count which gives it a smooth and luxurious feel. The golden rule for fabric; the higher the thread count, the softer the feel of the bed linen. Unfortunately, 100% cotton sheets crease more easily and take time ironing to keep the bed looking good. For this reason, many people prefer Poly Cotton Percale which is a combination of polyester and cotton and is an easy-care linen fabric. Linon has brought in a Poly Cotton Percale linen fabric that is a 200 thread count, 60% Cotton and 40% Polyester blend which they believe to be the perfect compromise between comfort and easy-care. Perhaps one of the easiest and simplest tips to implement; getting into a bedtime routine. We all have our morning routines for getting ready and going to work, so why don’t we all have a bedtime routine as well? Setting a bedtime, and most of all, sticking to it! This habit is vitally important for improving sleep quality. It allows you to set aside the recommended seven to eight hours a night, and helps regulate your body’s internal clock for optimised sleep quality. Many of us fall victim to sleeping with the TV on, or scrolling through Facebook just before bed – this can have a serious impact on your night’s sleep, leaving you feeling groggy and tired in the morning. Try turning off all electrical items with a screen, at least one hour before bed time and notice the difference in your sleeping pattern. Linon has over 120 years of combined experience in the hospitality linen and towel industry. They supply a full range of fabulous bedding items, from easy-care 200 thread count Poly Percale to crisp luxuriously soft 200 thread count & 300 thread count 100% Pure Cotton Bed Linen. Their Quilted Protectors also add a layer of softness to your mattress and pillows, Deluxe Microfibre Duvets & Pillows that feel like down and are non-allergenic. Transform your bed and guarantee a great night’s sleep. Linon invites you to try their hospitality linen and towel and to see how Linon compares for service, quality, convenience and cost. Get in touch with the right people the first time. We look forward to assisting you. Uncompromising quality and great value. Our aim is to bring our range directly to customers at unbeatable prices. Great article, this has helped me figure out a few bad habits I need to get out of like looking at my phone screen before bed. Thanks a lot!